In !NDEBUG builds, prints the message and location info to stderr. In NDEBUG builds, becomes an optimizer hint that the current location is not supposed to be reachable. On compilers that don't support such hints, prints a reduced message instead. Use this instead of assert(0). It conveys intent more clearly and allows compilers to omit some unnecessary code. 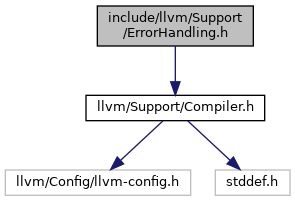 Definition at line 135 of file ErrorHandling.h. Referenced by llvm::AArch64VectorLayoutToString(), llvm::opt::Option::accept(), llvm::PMDataManager::add(), llvm::APFloat::add(), llvm::ExecutionEngine::addArchive(), AddCombineBUILD_VECTORToVPADDL(), addData(), llvm::MachineInstrBuilder::addDisp(), llvm::DwarfDebug::addDwarfTypeUnitType(), llvm::SoftInstrProfErrors::addError(), addExclusiveRegPair(), llvm::DwarfExpression::addExpression(), llvm::FoldingSetNodeID::AddInteger(), llvm::MachineBasicBlock::addLiveIn(), llvm::PMDataManager::addLowerLevelRequiredPass(), llvm::InterleaveGroup< llvm::Instruction >::addMetadata(), addNegOperand(), AddNodeIDCustom(), llvm::GISelInstProfileBuilder::addNodeIDMachineOperand(), addNonConstUser(), llvm::ExecutionEngine::addObjectFile(), addOps(), llvm::TargetPassConfig::addPass(), addSaveRestoreRegs(), llvm::DIEHash::addSLEB128(), addStackMapLiveVars(), llvm::DivergenceAnalysis::addUniformOverride(), llvm::AVRAsmBackend::adjustFixupValue(), adjustFixupValue(), llvm::SectionMemoryManager::allocateCodeSection(), alwaysAvailable(), llvm::AMDGPUInstructionSelector::AMDGPUInstructionSelector(), llvm::analyzeArguments(), llvm::SIInstrInfo::analyzeBranch(), llvm::CCState::AnalyzeCallOperands(), llvm::CCState::AnalyzeCallResult(), llvm::CCState::AnalyzeFormalArguments(), llvm::AMDGPUTargetLowering::analyzeFormalArgumentsCompute(), llvm::CCState::AnalyzeReturn(), AnalyzeReturnValues(), llvm::MemorySSAUpdater::applyInsertUpdates(), llvm::RegisterBankInfo::applyMappingImpl(), llvm::applyPPChighesta(), llvm::ARCMCInstLower::ARCMCInstLower(), areCombinableOperations(), areInverseVectorBitmasks(), areLoopExitPHIsLoopInvariant(), ARM64CountOfUnwindCodes(), ARM64EmitUnwindCode(), llvm::ARMBaseInstrInfo::ARMBaseInstrInfo(), llvm::ARMCondCodeToString(), llvm::ARMLegalizerInfo::ARMLegalizerInfo(), llvm::HexagonFrameLowering::assignCalleeSavedSpillSlots(), llvm::CallLowering::ValueHandler::assignCustomValue(), AssignProtectedObjSet(), atomicSizeSupported(), llvm::AVRDAGToDAGISel::select< ISD::LOAD >(), BBHasFallthrough(), llvm::MCStreamer::BeginCOFFSymbolDef(), llvm::BinaryOperator::BinaryOperator(), llvm::fuzzerop::binOpDescriptor(), bitcastf32Toi32(), llvm::yaml::ScalarBitSetTraits< ELFYAML::ELF_EF >::bitset(), llvm::APFloat::bitwiseIsEqual(), branchMaxOffsets(), branchTargetOperand(), llvm::BTFDebug::BTFDebug(), llvm::BTFTypeDerived::BTFTypeDerived(), llvm::BTFTypeInt::BTFTypeInt(), BuildConstantFromSCEV(), buildExtractionBlockSet(), llvm::SIInstrInfo::buildExtractSubRegOrImm(), llvm::R600InstrInfo::buildIndirectRead(), llvm::R600InstrInfo::buildIndirectWrite(), buildMultiplyTree(), buildNew(), llvm::TargetInstrInfo::buildOutlinedFrame(), calculateByteProvider(), CalculateStackSlotAlignment(), calculateStateNumbersForInvokes(), callingConvSupported(), callsiteIsHot(), canBeHidden(), llvm::canConstantFoldCallTo(), llvm::objcarc::CanDecrementRefCount(), llvm::objcarc::CanInterruptRV(), llvm::slpvectorizer::BoUpSLP::canMapToVector(), canMoveInstsAcrossMemOp(), canonicalizeICmpBool(), llvm::cantFail(), canTurnIntoCOPY(), canUseLocalRelocation(), llvm::ConstantRange::castOp(), CC_ARM_AAPCS_Custom_Aggregate(), CC_Lanai32_VarArg(), CC_MipsO32(), CC_MipsO32_FP32(), CC_MipsO32_FP64(), CC_PPC_AnyReg_Error(), CC_RISCV(), CC_X86_AnyReg_Error(), CC_X86_VectorCallAssignRegister(), llvm::R600TargetLowering::CCAssignFnForCall(), llvm::AMDGPUCallLowering::CCAssignFnForReturn(), llvm::AArch64TargetLowering::CCAssignFnForReturn(), llvm::ARMTargetLowering::CCAssignFnForReturn(), CCMaskForCondCode(), chainToBasePointerCost(), changeFCMPPredToAArch64CC(), changeFPCCToAArch64CC(), changeICMPPredToAArch64CC(), changeIntCCToAArch64CC(), Check(), llvm::RuntimeDyldCheckerImpl::checkAllRulesInBuffer(), CheckBaseRegAndIndexRegAndScale(), llvm::SelectionDAGISel::CheckComplexPattern(), CheckForCanReleaseCFGHazard(), CheckForUseCFGHazard(), llvm::SelectionDAGISel::CheckNodePredicate(), llvm::SelectionDAGISel::CheckNodePredicateWithOperands(), llvm::SelectionDAGISel::CheckPatternPredicate(), checkV64LaneV128(), llvm::X86InstrInfo::classifyLEAReg(), llvm::X86Subtarget::classifyLocalReference(), llvm::ReturnInst::classof(), llvm::ResumeInst::classof(), llvm::UnreachableInst::classof(), llvm::InstrProfRecord::clearValueData(), llvm::MachineRegisterInfo::clearVirtRegs(), llvm::Instruction::clone(), llvm::MDNode::clone(), cloneInstructionWithNewAddressSpace(), llvm::FunctionComparator::cmpConstants(), llvm::fuzzerop::cmpOpDescriptor(), llvm::FunctionComparator::cmpTypes(), llvm::ModuleSymbolTable::CollectAsmSymbols(), llvm::collectCmpOps(), CollectOpsToWiden(), CombineBaseUpdate(), combineFMADDSUB(), combineFMinFMax(), llvm::AMDGPUTargetLowering::combineFMinMaxLegacy(), llvm::combineMetadata(), combineRedundantDWordShuffle(), llvm::X86InstrInfo::commuteInstructionImpl(), llvm::detail::IEEEFloat::compare(), llvm::APFloat::compare(), llvm::detail::IEEEFloat::compareAbsoluteValue(), compareMachineOp(), CompareSCEVComplexity(), llvm::FunctionComparator::compareSignature(), llvm::TargetRegisterInfo::composeSubRegIndexLaneMaskImpl(), llvm::TargetRegisterInfo::composeSubRegIndicesImpl(), llvm::HexagonEvaluator::composeWithSubRegIndex(), llvm::BitTracker::MachineEvaluator::composeWithSubRegIndex(), llvm::SchedDFSResult::compute(), computeBranchTargetAndInversion(), computeBytesPoppedByCalleeForSRet(), computeCalleeSaveRegisterPairs(), llvm::MCAssembler::computeFragmentSize(), llvm::IndexedInstrProf::ComputeHash(), llvm::MCSchedModel::computeInstrLatency(), llvm::TargetSchedModel::computeOperandLatency(), ComputePostOrders(), llvm::TargetLoweringBase::computeRegisterProperties(), computeTargetABI(), condCodeToFCC(), llvm::ConstantFoldBinaryInstruction(), llvm::ConstantFoldCastInstruction(), llvm::ConstantFoldCastOperand(), llvm::ConstantFoldCompareInstruction(), llvm::ConstantFoldLoadFromConstPtr(), llvm::APFloat::convert(), convertCalleeSaveRestoreToSPPrePostIncDec(), ConvertCarryFlagToBooleanCarry(), ConvertDoubleToBytes(), convertFPR32ToFPR64(), convertGR16ToGR8(), convertImplicitDefToConstZero(), convertLocVTToValVT(), llvm::detail::IEEEFloat::convertToDouble(), llvm::AArch64InstrInfo::convertToFlagSettingOpc(), llvm::ARMBaseInstrInfo::convertToThreeAddress(), llvm::X86InstrInfo::convertToThreeAddress(), convertValVTToLocVT(), convertZlibCodeToString(), llvm::BPFInstrInfo::copyPhysReg(), llvm::RISCVInstrInfo::copyPhysReg(), llvm::MSP430InstrInfo::copyPhysReg(), llvm::WebAssemblyInstrInfo::copyPhysReg(), llvm::LanaiInstrInfo::copyPhysReg(), llvm::NVPTXInstrInfo::copyPhysReg(), llvm::XCoreInstrInfo::copyPhysReg(), llvm::AVRInstrInfo::copyPhysReg(), llvm::SparcInstrInfo::copyPhysReg(), llvm::AArch64InstrInfo::copyPhysReg(), llvm::HexagonInstrInfo::copyPhysReg(), llvm::SystemZInstrInfo::copyPhysReg(), llvm::PPCInstrInfo::copyPhysReg(), llvm::TargetInstrInfo::copyPhysReg(), CountOfUnwindCodes(), llvm::zlib::crc32(), llvm::RuntimeDyldCOFF::create(), llvm::MinidumpYAML::Stream::create(), llvm::RuntimeDyldMachO::create(), llvm::CastInst::Create(), llvm::ConstantExprKeyType::create(), llvm::UnaryOperator::Create(), createARMAsmBackend(), createBBSelectReg(), llvm::object::createBinary(), createFFSIntrinsic(), llvm::createLanaiAsmBackend(), llvm::Target::createMCObjectStreamer(), createMCStreamer(), llvm::createMinMaxOp(), llvm::createObjCARCOptPass(), llvm::MCAsmBackend::createObjectWriter(), createOrdering(), createPPCMCAsmInfo(), createRdxShuffleMask(), createReplacementInstr(), llvm::createRISCVMCCodeEmitter(), createSegmentsForValues(), llvm::createSimpleTargetReduction(), llvm::createSIPreAllocateWWMRegsPass(), llvm::createSparcDelaySlotFillerPass(), llvm::AMDGPUDisassembler::createSRegOperand(), llvm::createTargetReduction(), createTLOF(), createUniqueEntity(), llvm::HexagonInstrInfo::createVR(), llvm::createX86IssueVZeroUpperPass(), llvm::createX86RetpolineThunksPass(), llvm::object::ObjectFile::createXCOFFObjectFile(), llvm::RuntimeDyldMachOAArch64::decodeAddend(), DecodeCGImm(), DecodeDEXT(), DecodeDINS(), llvm::AMDGPUDisassembler::decodeDstOp(), DecodeFixedType(), llvm::AMDGPUDisassembler::decodeFPImmed(), llvm::codeview::decodeFramePtrReg(), DecodeIITType(), DecodeINSVE_DF(), llvm::ARM_AM::decodeNEONModImm(), llvm::AMDGPUDisassembler::decodeSDWASrc(), DecodeSrcAddrMode(), llvm::AMDGPUDisassembler::decodeSrcOp(), decomposeSimpleLinearExpr(), llvm::LegalizerInfo::decreaseToSmallerTypesAndIncreaseToSmallest(), llvm::ilist_alloc_traits< SDNode >::deleteNode(), llvm::Value::deleteValue(), llvm::objcarc::Depends(), llvm::DependenceInfo::depends(), llvm::HexagonMCInstrInfo::deriveExtender(), llvm::HexagonMCInstrInfo::deriveSubInst(), despeculateCountZeros(), llvm::Constant::destroyConstant(), llvm::TargetOptions::DisableFramePointerElim(), llvm::DisplayGraph(), llvm::APFloat::divide(), llvm::NVPTXAsmPrinter::doFinalization(), llvm::FunctionImportGlobalProcessing::doImportAsDefinition(), llvm::AsmPrinter::doInitialization(), llvm::MDNode::dropAllReferences(), llvm::DWARFDebugLoclists::LocationList::dump(), llvm::SplitEditor::dump(), llvm::ScheduleDAGInstrs::Value2SUsMap::dump(), dumpRelocs(), duplicateCPV(), ehAwareSplitEdge(), llvm::XCoreFrameLowering::eliminateCallFramePseudoInstr(), llvm::SIFrameLowering::eliminateCallFramePseudoInstr(), llvm::SystemZFrameLowering::eliminateCallFramePseudoInstr(), llvm::TargetFrameLowering::eliminateCallFramePseudoInstr(), llvm::BPFRegisterInfo::eliminateFrameIndex(), llvm::LanaiRegisterInfo::eliminateFrameIndex(), llvm::R600RegisterInfo::eliminateFrameIndex(), llvm::ThumbRegisterInfo::eliminateFrameIndex(), llvm::SIRegisterInfo::eliminateSGPRToVGPRSpillFrameIndex(), llvm::DIEAbbrev::Emit(), llvm::AMDGPUTargetAsmStreamer::EmitAMDGPUSymbolType(), llvm::MCWinCOFFStreamer::EmitAssemblerFlag(), llvm::MCELFStreamer::EmitAssemblerFlag(), llvm::MCWasmStreamer::EmitAssemblerFlag(), llvm::PPCTargetLowering::EmitAtomicBinary(), llvm::MCObjectStreamer::EmitBundleAlignMode(), llvm::MCObjectStreamer::EmitBundleLock(), llvm::MCObjectStreamer::EmitBundleUnlock(), llvm::AsmPrinter::emitCFIInstruction(), EmitCMP(), llvm::MCStreamer::EmitCOFFSymbolStorageClass(), llvm::MCStreamer::EmitCOFFSymbolType(), llvm::MCWasmStreamer::EmitCommonSymbol(), llvm::InstrEmitter::EmitDbgLabel(), emitDebugRangesImpl(), llvm::MipsAsmPrinter::EmitDebugValue(), emitEncodingByte(), llvm::WebAssemblyTargetWasmStreamer::emitEndFunc(), llvm::MSP430FrameLowering::emitEpilogue(), llvm::SystemZFrameLowering::emitEpilogue(), llvm::X86AsmPrinter::EmitFunctionBodyEnd(), EmitHiLo(), llvm::MCWinCOFFStreamer::EmitIdent(), llvm::WebAssemblyTargetWasmStreamer::emitIndIdx(), llvm::orc::OrcGenericABI::emitIndirectStubsBlock(), llvm::ARMTargetStreamer::emitInst(), llvm::ARMAsmPrinter::EmitInstruction(), llvm::X86AsmPrinter::EmitInstruction(), llvm::MipsAsmPrinter::EmitInstruction(), llvm::AsmPrinter::EmitInstruction(), llvm::SparcTargetLowering::EmitInstrWithCustomInserter(), llvm::RISCVTargetLowering::EmitInstrWithCustomInserter(), llvm::ARMTargetLowering::EmitInstrWithCustomInserter(), llvm::AArch64TargetLowering::EmitInstrWithCustomInserter(), llvm::MipsTargetLowering::EmitInstrWithCustomInserter(), llvm::SystemZTargetLowering::EmitInstrWithCustomInserter(), llvm::PPCTargetLowering::EmitInstrWithCustomInserter(), llvm::X86TargetLowering::EmitInstrWithCustomInserter(), llvm::TargetLowering::EmitInstrWithCustomInserter(), llvm::MCObjectStreamer::EmitInstToFragment(), llvm::AsmPrinter::EmitJumpTableInfo(), llvm::ARMAsmPrinter::EmitJumpTableTBInst(), llvm::ARMTargetLowering::emitLeadingFence(), llvm::TargetLoweringBase::emitLoadLinked(), llvm::MCWasmStreamer::EmitLocalCommonSymbol(), llvm::AsmPrinter::EmitMachineConstantPoolValue(), llvm::TargetLoweringBase::emitMaskedAtomicCmpXchgIntrinsic(), llvm::TargetLoweringBase::emitMaskedAtomicRMWIntrinsic(), EmitNop(), EmitNops(), emitNullTerminatedSymbolName(), emitPostSt(), llvm::ARMFrameLowering::emitPrologue(), llvm::SystemZFrameLowering::emitPrologue(), llvm::PPCFrameLowering::emitPrologue(), llvm::MCObjectStreamer::EmitRelocDirective(), llvm::MSP430TargetLowering::EmitShiftInstr(), emitSignedInt64(), llvm::TargetLowering::emitStackGuardXorFP(), llvm::X86AsmPrinter::EmitStartOfAsmFile(), llvm::TargetLoweringBase::emitStoreConditional(), llvm::MCWinCOFFStreamer::EmitSymbolAttribute(), llvm::MCELFStreamer::EmitSymbolAttribute(), llvm::MCWasmStreamer::EmitSymbolAttribute(), llvm::MCWinCOFFStreamer::EmitSymbolDesc(), llvm::MCELFStreamer::EmitSymbolDesc(), llvm::MCWasmStreamer::EmitSymbolDesc(), llvm::MCELFStreamer::EmitTBSSSymbol(), llvm::MCWinCOFFStreamer::EmitTBSSSymbol(), llvm::MCWasmStreamer::EmitTBSSSymbol(), EmitTest(), llvm::MCWinCOFFStreamer::EmitThumbFunc(), llvm::MCELFStreamer::EmitThumbFunc(), llvm::MCWasmStreamer::EmitThumbFunc(), llvm::ARMTargetLowering::emitTrailingFence(), llvm::InnerLoopVectorizer::emitTransformedIndex(), EmitUnwindCode(), llvm::DIEInteger::EmitValue(), llvm::DIEString::EmitValue(), llvm::DIEInlineString::EmitValue(), llvm::DIEEntry::EmitValue(), llvm::DIEValue::EmitValue(), llvm::DIELoc::EmitValue(), llvm::DIEBlock::EmitValue(), llvm::MCWinCOFFStreamer::EmitWinEHHandlerData(), llvm::AsmPrinter::emitXRayTable(), llvm::MCELFStreamer::EmitZerofill(), llvm::MCWasmStreamer::EmitZerofill(), llvm::MCWinCOFFStreamer::EmitZerofill(), llvm::RuntimeDyldMachOAArch64::encodeAddend(), encodeBase64StringEntry(), encodeBitmaskPerm(), llvm::BitCodeAbbrevOp::EncodeChar6(), llvm::CodeViewContext::encodeInlineLineTable(), llvm::MipsMCCodeEmitter::encodeInstruction(), llvm::MSP430MCCodeEmitter::encodeInstruction(), llvm::PPCMCCodeEmitter::encodeInstruction(), llvm::HexagonMCCodeEmitter::EncodeSingleInstruction(), llvm::MCStreamer::EndCOFFSymbolDef(), llvm::DwarfDebug::endFunctionImpl(), llvm::DwarfDebug::endModule(), EnsureStackAlignment(), llvm::yaml::ScalarEnumerationTraits< ELFYAML::ELF_REL >::enumeration(), llvm::rdf::DeadCodeElimination::erase(), llvm::GlobalValue::eraseFromParent(), llvm::VPRecipeBase::eraseFromParent(), eraseGPOpnd(), llvm::RuntimeDyldCheckerExprEval::evaluate(), llvm::coverage::CounterMappingContext::evaluate(), llvm::RISCVMCExpr::evaluateAsConstant(), llvm::PPCMCExpr::evaluateAsConstant(), llvm::AVRMCExpr::evaluateAsRelocatableImpl(), llvm::MCExpr::evaluateAsRelocatableImpl(), llvm::MipsMCExpr::evaluateAsRelocatableImpl(), llvm::PPCMCExpr::evaluateAsRelocatableImpl(), EvaluateConstantChrecAtConstant(), EvaluateCRExpr(), evaluateInDifferentElementOrder(), llvm::SelectionDAG::EVTToAPFloatSemantics(), llvm::VPlan::execute(), executeCmpInst(), executeFAddInst(), executeFCMP_OEQ(), executeFCMP_OGE(), executeFCMP_OGT(), executeFCMP_OLE(), executeFCMP_OLT(), executeFCMP_ONE(), executeFDivInst(), executeFMulInst(), executeFRemInst(), executeFSubInst(), executeICMP_EQ(), executeICMP_NE(), executeICMP_SGE(), executeICMP_SGT(), executeICMP_SLE(), executeICMP_SLT(), executeICMP_UGE(), executeICMP_UGT(), executeICMP_ULE(), executeICMP_ULT(), llvm::InstructionSelector::executeMatchTable(), llvm::BitstreamWriter::ExitBlock(), ExpandBVWithShuffles(), llvm::SCEVExpander::expandCodeForPredicate(), expandf64Toi32(), llvm::PPCTargetLowering::expandVSXLoadForLE(), llvm::PPCInstrInfo::expandVSXMemPseudo(), llvm::PPCTargetLowering::expandVSXStoreForLE(), llvm::CallLowering::ValueHandler::extendRegister(), llvm::DWARFExpression::Operation::extract(), extractBitsForFixup(), extractSubModule(), llvm::DWARFFormValue::extractValue(), llvm::FaultMaps::faultTypeToString(), llvm::LegalizerHelper::fewerElementsVector(), llvm::GISelWorkList< 8 >::finalize(), llvm::AccelTableBase::finalize(), llvm::RuntimeDyldMachOARM::finalizeSection(), llvm::SparseBitVectorElement< ElementSize >::find_first(), llvm::SparseBitVectorElement< ElementSize >::find_last(), llvm::MCExpr::findAssociatedFragment(), llvm::AArch64MCExpr::findAssociatedFragment(), findBaseDefiningValue(), findBasePointer(), findCorrespondingPred(), findFirstFreeSGPR(), llvm::findStringMetadataForLoop(), llvm::orc::NullLegacyResolver::findSymbol(), llvm::orc::NullLegacyResolver::findSymbolInLogicalDylib(), llvm::MachineInstr::findTiedOperandIdx(), findUncondBrI(), findUser(), llvm::DwarfCompileUnit::finishEntityDefinition(), FixedPointIntrinsicToOpcode(), llvm::MipsMCExpr::fixELFSymbolsInTLSFixups(), fixELFSymbolsInTLSFixupsImpl(), FixTail(), fixupCalleeSaveRestoreStackOffset(), llvm::AVRAsmBackend::fixupNeedsRelaxation(), llvm::MipsAsmBackend::fixupNeedsRelaxation(), llvm::RISCVAsmBackend::fixupNeedsRelaxation(), fixupSEHOpcode(), llvm::BinOpInit::Fold(), foldFabsWithFcmpZero(), foldICmpShlOne(), foldICmpWithLowBitMaskedVal(), foldICmpWithMinMax(), foldPatchpoint(), foldSelectICmpAnd(), llvm::SelectionDAG::FoldSetCC(), foldSignedTruncationCheck(), foldUDivPow2Cst(), foldUDivShl(), for(), forceIndeterminateEdge(), forEachUser(), llvm::format_provider< llvm::json::Value >::format(), llvm::MCInstPrinter::formatHex(), llvm::RegScavenger::forward(), FPCCToARMCC(), FPCondCCodeToFCC(), llvm::frexp(), llvm::detail::frexp(), llvm::CodeViewYAML::LeafRecord::fromCodeViewRecord(), FunctionNumber(), llvm::APFloat::fusedMultiplyAdd(), LoopFuser::fuseLoops(), llvm::dwarf::GDBIndexEntryKindString(), llvm::dwarf::GDBIndexEntryLinkageString(), GeneratePerfectShuffle(), llvm::objcarc::ARCRuntimeEntryPoints::get(), llvm::ConstantInt::get(), llvm::objcarc::ARCMDKindCache::get(), llvm::ConstantTokenNone::get(), getAArch64XALUOOp(), getAbsoluteReloc(), getAccessVariant(), llvm::MCValue::getAccessVariant(), llvm::MCFixup::getAddKindForKind(), llvm::DWARFObject::getAddressSize(), llvm::R600InstrInfo::getAddressSpaceForPseudoSourceKind(), getADDriFromLEA(), getADDrrFromLEA(), getAddrSpace(), getAdjustedAlignment(), getAdjustedCmp(), GetAEABIUnwindPersonalityName(), getAlignment(), llvm::APFloat::getAllOnesValue(), llvm::ARM_AM::getAMSubModeStr(), llvm::RegBankSelect::getAnalysisUsage(), llvm::getAPFloatFromSize(), llvm::object::XCOFFObjectFile::getArch(), getArchPointerBitWidth(), llvm::Triple::getArchTypeName(), getARClassRegisterMask(), llvm::Triple::getARMCPUForArch(), llvm::Attribute::getAsString(), getAttrKindEncoding(), llvm::Triple::getBigEndianArchVariant(), llvm::WithOverflowInst::getBinaryOp(), llvm::MCSymbolELF::getBinding(), llvm::ConstantExpr::getBinOpIdentity(), llvm::StringInit::getBit(), llvm::CodeInit::getBit(), llvm::ListInit::getBit(), llvm::DefInit::getBit(), llvm::VarDefInit::getBit(), llvm::DagInit::getBit(), llvm::MSP430MCInstLower::GetBlockAddressSymbol(), llvm::ScalarEvolution::getBlockDisposition(), llvm::SelectionDAG::getBoolConstant(), llvm::AVRInstrInfo::getBranchDestBlock(), llvm::AArch64InstrInfo::getBranchDestBlock(), llvm::TargetInstrInfo::getBranchDestBlock(), getBranchDisplacementBits(), llvm::SystemZInstrInfo::getBranchInfo(), getBranchOpcodeForIntCondCode(), llvm::AVRInstrInfo::getBrCond(), llvm::pdb::NativeTypeEnum::getBuiltinType(), llvm::CallBase::getBundleOpInfoForOperand(), llvm::object::XCOFFObjectFile::getBytesInAddress(), llvm::MipsABIInfo::GetByValArgRegs(), llvm::X86TTIImpl::getCacheAssociativity(), llvm::TargetTransformInfoImplBase::getCacheAssociativity(), llvm::X86TTIImpl::getCacheSize(), llvm::TargetTransformInfoImplBase::getCacheSize(), llvm::MipsABIInfo::GetCalleeAllocdArgSizeInBytes(), llvm::WebAssembly::getCalleeOpNo(), llvm::RISCVRegisterInfo::getCalleeSavedRegs(), llvm::HexagonRegisterInfo::getCallerSavedRegs(), llvm::RISCVRegisterInfo::getCallPreservedMask(), llvm::ConstantExpr::getCast(), llvm::BasicTTIImplBase< AMDGPUTTIImpl >::getCastInstrCost(), llvm::CastInst::getCastOpcode(), llvm::object::COFFObjectFile::getCharacteristics(), getCIEVersion(), llvm::X86::getCMovOpcode(), llvm::object::COFFObjectFile::getCOFFSymbol(), llvm::object::XCOFFObjectFile::getCommonSymbolSizeImpl(), llvm::object::WasmObjectFile::getCommonSymbolSizeImpl(), getCommutedVPERMV3Opcode(), llvm::ConstantExpr::getCompare(), getCompareCC(), getComparePred(), getComplementOpc(), getCompoundOp(), GetCondBranchFromCond(), getCondCode(), llvm::AArch64CC::getCondCodeName(), llvm::HexagonInstrInfo::getCondOpcode(), llvm::SelectionDAG::getConstantFP(), getConstantPart(), llvm::MSP430MCInstLower::GetConstantPoolIndexSymbol(), llvm::ExecutionEngine::getConstantValue(), getConstantValue(), llvm::SIRegisterInfo::getConstrainedRegClassForOperand(), getConstraintGenerality(), getContiguousRangeOfSetBits(), getConvRTLibDesc(), getCopyFromParts(), llvm::CoroIdInst::getCoroBegin(), getCRIdxForSetCC(), llvm::MipsAsmPrinter::getCurrentABIString(), getDebugLocValue(), getDecoderTable(), getDefaultFormat(), llvm::WebAssembly::GetDefaultP2Align(), getDemandedSrcElements(), getDepth(), llvm::Check::FileCheckType::getDescription(), llvm::LLVMContext::getDiagnosticMessagePrefix(), getDivRemArgList(), getDivRemLibcall(), llvm::HexagonInstrInfo::getDotCurOp(), llvm::HexagonInstrInfo::getDotNewPredJumpOp(), getDropOpcode(), getDUPLANEOp(), llvm::HexagonMCInstrInfo::getDuplexRegisterNumbering(), llvm::DWARFUnit::getDWARF5HeaderSize(), llvm::dwarf::FormParams::getDwarfOffsetByteSize(), getDwarfRegNum(), llvm::getEHPersonalityName(), llvm::ConstantDataSequential::getElementAsAPFloat(), llvm::ConstantDataSequential::getElementAsAPInt(), llvm::ConstantDataSequential::getElementAsInteger(), getElementByteSizeValue(), llvm::AMDGPUTargetStreamer::getElfMach(), getEnableSplitLTOUnitFlag(), getEncodedBinaryOpcode(), getEncodedCastOpcode(), getEncodedComdatSelectionKind(), getEncodedDLLStorageClass(), getEncodedLinkage(), getEncodedOrdering(), getEncodedRMWOperation(), getEncodedThreadLocalMode(), getEncodedUnaryOpcode(), getEncodedUnnamedAddr(), getEncodedVisibility(), llvm::MachineTraceMetrics::getEnsemble(), llvm::MachineJumpTableInfo::getEntryAlignment(), llvm::MachineJumpTableInfo::getEntrySize(), llvm::Triple::getEnvironmentTypeName(), getEquivalentCallShort(), llvm::SIRegisterInfo::getEquivalentSGPRClass(), llvm::SIRegisterInfo::getEquivalentVGPRClass(), llvm::EVT::getEVTString(), llvm::ARMTargetLowering::getExceptionSelectorRegister(), llvm::ARMConstantPoolValue::getExistingMachineCPValue(), getExpandedMinMaxOps(), llvm::SystemZMCInstLower::getExpr(), llvm::MipsMCCodeEmitter::getExprOpValue(), llvm::AArch64_AM::getExtendEncoding(), llvm::TargetLoweringBase::getExtendForContent(), llvm::AArch64_AM::getExtendType(), getExtensionTo64Bits(), llvm::MSP430MCInstLower::GetExternalSymbolSymbol(), llvm::ISD::getExtForLoadExtType(), llvm::ARMBaseInstrInfo::getExtractSubregLikeInputs(), llvm::AArch64TTIImpl::getExtractWithExtendCost(), getFailureName(), llvm::getFCmpCondCode(), llvm::object::XCOFFObjectFile::getFeatures(), llvm::object::XCOFFObjectFile::getFileFormatName(), llvm::DWARFObject::getFileName(), getFirstNonAllocaInTheEntryBlock(), llvm::TargetLoweringBase::getFixedPointOperationAction(), llvm::AVRMCExpr::getFixupKind(), llvm::SparcMCExpr::getFixupKind(), getFixupKindContainerSizeBytes(), getFixupKindLog2Size(), getFixupKindNumBytes(), getFixupOffset(), getFixupSection(), llvm::CmpInst::getFlippedStrictnessPredicate(), llvm::MVT::getFloatingPointVT(), llvm::SMTSolver::getFloatSort(), llvm::Type::getFltSemantics(), llvm::MipsABIFlagsSection::getFpABIString(), llvm::MipsABIFlagsSection::getFpABIValue(), getFPBinOp(), GetFPLibCall(), getFPReg(), getFPTernOp(), llvm::ARMBaseRegisterInfo::getFrameIndexInstrOffset(), llvm::SelectionDAGBuilder::getFrameIndexTy(), llvm::getFunctionName(), llvm::jitlink::getGenericEdgeKindName(), llvm::MSP430MCInstLower::GetGlobalAddressSymbol(), llvm::MipsDAGToDAGISel::getGlobalBaseReg(), llvm::DataLayout::getGlobalPrefix(), llvm::RuntimeDyldELF::getGOTEntrySize(), llvm::DenseMapInfo< MemOpKey >::getHashValue(), llvm::PPCHazardRecognizer970::getHazardType(), llvm::DWARFDebugAddrTable::getHeaderSize(), llvm::DWARFListTableBase< DWARFDebugRnglist >::getHeaderSize(), llvm::HexagonRegisterInfo::getHexagonSubRegIndex(), llvm::sys::detail::getHostCPUNameForBPF(), llvm::getHotnessName(), llvm::getICmpCode(), llvm::getICmpCondCode(), llvm::object::getImgRelRelocation(), getImmFixupKind(), getImmScale(), llvm::AMDGPUTargetLowering::getImplicitParameterOffset(), llvm::SelectionDAGISel::getIncludePathForIndex(), llvm::InterleaveGroup< llvm::Instruction >::getIndex(), llvm::DataLayout::getIndexTypeSizeInBits(), llvm::TargetFrameLowering::getInitialCFAOffset(), llvm::TargetFrameLowering::getInitialCFARegister(), GetInitialOffset(), getInlineImmVal16(), getInlineImmVal32(), getInlineImmVal64(), getInsertPointForUses(), llvm::ARMBaseInstrInfo::getInsertSubregLikeInputs(), getInsertVecEltOpInfo(), llvm::MemDepResult::getInst(), llvm::AArch64RegisterBankInfo::getInstrAlternativeMappings(), llvm::RegisterBankInfo::getInstrMapping(), llvm::TargetTransformInfo::getInstructionCost(), getInstrVecReg(), getIntOperandFromRegisterString(), getIntrinsicCmp(), getIntrinsicForMaskedAtomicRMWBinOp(), getIntrinsicParamType(), llvm::getInverseMinMaxFlavor(), llvm::CmpInst::getInversePredicate(), llvm::HexagonInstrInfo::getInvertedPredicatedOpcode(), llvm::Triple::getiOSVersion(), getIPMConversion(), getItaniumTypeName(), llvm::ARMTargetLowering::getJumpTableEncoding(), llvm::MSP430MCInstLower::GetJumpTableSymbol(), llvm::SIInstrInfo::getKillTerminatorFromPseudo(), llvm::MCFixup::getKindForSize(), llvm::getLanaiRegisterNumbering(), llvm::AVRRegisterInfo::getLargestLegalSuperClass(), getLCFromMCVM(), getLeaOP(), llvm::getLibcallSignature(), getLinkageName(), getLit64Encoding(), llvm::Triple::getLittleEndianArchVariant(), llvm::DstOp::getLLTTy(), llvm::SrcOp::getLLTTy(), getLoadExtOrTrunc(), llvm::PPCInstrInfo::getLoadOpcodeForSpill(), getLoadStoreMultipleOpcode(), getLoadStoreMultipleSubMode(), llvm::SystemZInstrInfo::getLoadStoreOpcodes(), getLoadStoreRegOpcode(), llvm::GCNTTIImpl::getLoadStoreVecRegBitWidth(), llvm::R600TTIImpl::getLoadStoreVecRegBitWidth(), getLocalGetOpcode(), getLocalSetOpcode(), getLocalTeeOpcode(), getLog2EVal(), llvm::ScalarEvolution::getLoopDisposition(), llvm::object::COFFObjectFile::getMachine(), llvm::Triple::getMacOSXVersion(), getMangledTypeStr(), getMappedOp(), llvm::getMatchingCondBranchOpcode(), getMatchingPairOpcode(), getMatchingWideOpcode(), llvm::InstructionSelector::getMatchTable(), llvm::RegPressureTracker::getMaxUpwardPressureDelta(), llvm::HexagonInstrInfo::getMemAccessSize(), llvm::X86II::getMemoryOperandNo(), getMemScale(), getMemsetStringVal(), llvm::getMinMaxPred(), getMinVisibility(), llvm::object::ELFObjectFileBase::getMIPSFeatures(), llvm::slpvectorizer::BoUpSLP::VLOperands::getModeStr(), llvm::ARMConstantPoolValue::getModifierText(), getModifierVariantKind(), getMopState(), llvm::MipsMCCodeEmitter::getMovePRegSingleOpValue(), getMOVL(), getMOVRELDPseudo(), llvm::DiagnosticInfoOptimizationBase::getMsg(), llvm::sampleprof::FunctionSamples::getNameInModule(), getNarrowIntrinsic(), GetNegatedExpression(), getNewValueJumpOpcode(), llvm::remarks::Parser::getNext(), getNextRegister(), llvm::rdf::DataFlowGraph::getNextShadow(), getNextVectorRegister(), llvm::SelectionDAG::getNode(), llvm::BFIDOTGraphTraitsBase< BlockFrequencyInfoT, BranchProbabilityInfoT >::getNodeLabel(), llvm::HexagonInstrInfo::getNonDotCurOp(), llvm::TargetInstrInfo::getNoop(), llvm::TargetRegisterInfo::getNoPreservedMask(), llvm::Constant::getNullValue(), llvm::object::COFFObjectFile::getNumberOfSections(), llvm::ARMBaseInstrInfo::getNumMicroOps(), llvm::TargetLoweringBase::getNumRegisters(), llvm::orc::OrcGenericABI::IndirectStubsInfo::getNumStubs(), llvm::CallBase::getNumSubclassExtraOperands(), getNumSubRegsForSpillOp(), llvm::Instruction::getNumSuccessors(), llvm::AArch64CC::getNZCVToSatisfyCondCode(), getObjectFormatTypeName(), getOffsetFromIndices(), getOModValue(), llvm::PMDataManager::getOnTheFlyPass(), getOpcodeForRetpoline(), getOpenCLAlignment(), llvm::BinOpInit::getOperand(), llvm::TernOpInit::getOperand(), llvm::X86II::getOperandBias(), getOperands(), llvm::AMDGPU::getOperandSize(), llvm::TargetTransformInfoImplBase::getOperationCost(), llvm::AtomicRMWInst::getOperationName(), llvm::SDNode::getOperationName(), getOpIdxForMO(), getOppositeALULoOpcode(), llvm::X86::GetOppositeBranchCondition(), GetOppositeBranchCondition(), llvm::MipsSEInstrInfo::getOppositeBranchOpc(), llvm::Mips16InstrInfo::getOppositeBranchOpc(), getOppositeBranchOpcode(), llvm::ARMCC::getOppositeCondition(), llvm::AVRInstrInfo::getOppositeCondition(), getOppositeCondition(), llvm::TargetPassConfig::getOptimizeRegAlloc(), getOptionalBoolLoopAttribute(), getOptionHelpName(), llvm::MCContext::getOrCreateLSDASymbol(), getOSTypeFromMCVM(), getOSTypeFromPlatform(), llvm::Triple::getOSTypeName(), llvm::TargetInstrInfo::getOutliningCandidateInfo(), llvm::TargetInstrInfo::getOutliningType(), llvm::rdf::RefNode::getOwner(), llvm::rdf::InstrNode::getOwner(), getParameterABIAttributes(), llvm::X86GenRegisterBankInfo::getPartialMappingIdx(), llvm::SelectionDAGISel::getPatternForIndex(), getPCRelReloc(), llvm::HexagonEvaluator::getPhysRegBitWidth(), llvm::PPCTargetLowering::getPICJumpTableRelocBaseExpr(), getPlatformName(), getPLTReloc(), getPointerOperands(), llvm::MipsRegisterInfo::getPointerRegClass(), llvm::X86RegisterInfo::getPointerRegClass(), llvm::TargetRegisterInfo::getPointerRegClass(), llvm::ExecutionEngine::getPointerToGlobal(), llvm::orc::OrcMCJITReplacement::getPointerToNamedFunction(), llvm::object::COFFObjectFile::getPointerToSymbolTable(), getPostIncrementOperand(), getPostIndexedLoadStoreOpcode(), getPostIndexedOpcode(), llvm::getPredForICmpCode(), llvm::SrcOp::getPredicate(), getPredicatedRegister(), getPredicateForSetCC(), getPrefixes(), getPreIndexedLoadStoreOpcode(), getPreIndexedOpcode(), llvm::AMDGPUFunctionArgInfo::getPreloadedValue(), llvm::AVRInstPrinter::getPrettyRegisterName(), llvm::DataLayout::getPrivateGlobalPrefix(), getProgramName(), GetPromotionOpcode(), getPropertyName(), llvm::NVPTXTargetLowering::getPrototype(), getPSHUFShuffleMask(), llvm::orc::OrcGenericABI::IndirectStubsInfo::getPtr(), getPTXCmpMode(), getRangeForAffineARHelper(), getRawAttributeMask(), llvm::object::COFFObjectFile::getRawNumberOfSymbols(), llvm::vfs::OverlayFileSystem::getRealPath(), getRealVLDOpcode(), getRealVSTOpcode(), getReasonStr(), llvm::GenericSchedulerBase::getReasonStr(), getReassignedChan(), llvm::MCSchedModel::getReciprocalThroughput(), llvm::pdb::TagRecordHash::getRecord(), getRecordKind(), llvm::RecurrenceDescriptor::getRecurrenceBinOp(), llvm::RecurrenceDescriptor::getRecurrenceIdentity(), getReducedType(), getReductionSDNode(), llvm::SrcOp::getReg(), llvm::ARMRegisterBankInfo::getRegBankFromRegClass(), llvm::MipsRegisterBankInfo::getRegBankFromRegClass(), llvm::X86RegisterBankInfo::getRegBankFromRegClass(), llvm::AArch64RegisterBankInfo::getRegBankFromRegClass(), llvm::RegisterBankInfo::getRegBankFromRegClass(), llvm::AMDGPU::getRegBitWidth(), llvm::DstOp::getRegClass(), getRegClassForUnfoldedLoad(), getRegClassFromGRPhysReg(), llvm::SITargetLowering::getRegisterByName(), getRegisterForMxtrC0(), getRegisterForMxtrDSP(), getRegisterForMxtrFP(), llvm::TargetLoweringBase::getRegisterType(), getRegisterWidth(), llvm::ARMBaseInstrInfo::getRegSequenceLikeInputs(), llvm::SIRegisterInfo::getRegSplitParts(), llvm::WebAssemblyAsmPrinter::getRegType(), getRelevantOperands(), llvm::object::XCOFFObjectFile::getRelocationOffset(), llvm::object::getRelocationResolver(), llvm::object::XCOFFObjectFile::getRelocationSymbol(), llvm::object::COFFObjectFile::getRelocationSymbol(), llvm::object::XCOFFObjectFile::getRelocationType(), llvm::object::XCOFFObjectFile::getRelocationTypeName(), llvm::AVRELFObjectWriter::getRelocType(), getRelocType(), getRelocType32(), getRelocType64(), llvm::CCState::getRemainingRegParmsForType(), llvm::opt::Option::getRenderStyle(), getRetOpcode(), getRetpolineSymbol(), getRISCVWOpcode(), GetRMWLibcall(), getRRMOpcodeVariant(), getRTLibDesc(), llvm::getSafeVectorConstantForBinop(), llvm::Type::getScalarTy(), getScalingFactorCost(), llvm::object::XCOFFObjectFile::getSectionAddress(), llvm::object::XCOFFObjectFile::getSectionAlignment(), llvm::object::XCOFFObjectFile::getSectionContents(), llvm::object::XCOFFObjectFile::getSectionIndex(), llvm::object::ELFObjectFile< ELFT >::getSectionIndex(), llvm::object::XCOFFObjectFile::getSectionName(), llvm::object::XCOFFObjectFile::getSectionSize(), getSelectedTLSModel(), getSelectFoldableConstant(), getSelectsInScope(), llvm::X86InstrInfo::getSerializableDirectMachineOperandTargetFlags(), llvm::AVRTargetLowering::getSetCCResultType(), getSGPRSpillRestoreOpcode(), getSGPRSpillSaveOpcode(), getShiftAmountTyForConstant(), getShiftedValue(), llvm::AArch64_AM::getShifterImm(), llvm::AArch64_AM::getShiftExtendName(), llvm::ARM_AM::getShiftOpcEncoding(), llvm::ARM_AM::getShiftOpcStr(), llvm::BasicTTIImplBase< AMDGPUTTIImpl >::getShuffleCost(), llvm::DataExtractor::getSigned(), llvm::CmpInst::getSignedPredicate(), llvm::ICmpInst::getSignedPredicate(), llvm::Twine::getSingleStringRef(), getSizeForEncoding(), llvm::MVT::getSizeInBits(), llvm::AsmPrinter::GetSizeOfEncodedValue(), llvm::X86II::getSizeOfImm(), llvm::object::COFFObjectFile::getSizeOfOptionalHeader(), getSlotedOps(), getSpecialRegForName(), getSpillFunctionFor(), llvm::DependenceInfo::getSplitIteration(), llvm::TargetLoweringObjectFileWasm::getStaticDtorSection(), getStoreOffset(), llvm::PPCInstrInfo::getStoreOpcodeForSpill(), llvm::TargetLoweringBase::getStrictFPOperationAction(), getStringReg(), llvm::AtomicCmpXchgInst::getStrongestFailureOrdering(), llvm::orc::OrcGenericABI::IndirectStubsInfo::getStub(), llvm::MCFixup::getSubKindForKind(), getSubprogram(), llvm::SIRegisterInfo::getSubRegClass(), llvm::Instruction::getSuccessor(), getSummaryKindName(), llvm::CmpInst::getSwappedPredicate(), llvm::X86::getSwappedVPCMPImm(), llvm::X86::getSwappedVPCOMImm(), llvm::object::XCOFFObjectFile::getSymbolAddress(), llvm::object::WasmObjectFile::getSymbolAlignment(), llvm::object::XCOFFObjectFile::getSymbolFlags(), llvm::object::XCOFFObjectFile::getSymbolName(), llvm::object::XCOFFObjectFile::getSymbolSection(), llvm::object::WasmObjectFile::getSymbolSection(), llvm::object::COFFObjectFile::getSymbolTableEntrySize(), llvm::object::XCOFFObjectFile::getSymbolType(), llvm::object::WasmObjectFile::getSymbolType(), llvm::object::XCOFFObjectFile::getSymbolValueImpl(), getTargetMBB(), llvm::ARCTargetLowering::getTargetNodeName(), getTargetShuffleMask(), getTargetVShiftByConstNode(), getTargetVShiftUniformOpcode(), getTeeOpcode(), getThreeSrcCommuteCase(), llvm::object::COFFObjectFile::getTimeDateStamp(), getTLSGDReloc(), getTLSLDMReloc(), getTLSLDOReloc(), getTLSLEReloc(), getTransSwizzle(), llvm::ScalarEvolution::getTruncateExpr(), getTTResKindName(), llvm::MCSymbolELF::getType(), llvm::SCEV::getType(), getType(), getType32(), getType64(), llvm::codeview::AppendingTypeTableBuilder::getTypeName(), llvm::codeview::MergingTypeTableBuilder::getTypeName(), llvm::codeview::GlobalTypeTableBuilder::getTypeName(), llvm::DataLayout::getTypeSizeInBits(), llvm::TargetLoweringBase::getTypeToExpandTo(), llvm::pdb::NativeTypeUDT::getUdtKind(), llvm::MipsMCCodeEmitter::getUImm4AndValue(), llvm::getUnaryFloatFn(), getUnconditionalBrDisp(), getUniformBase(), getUnnamedAddrEncoding(), llvm::DataExtractor::getUnsigned(), llvm::ICmpInst::getUnsignedPredicate(), getUpdatingLSMultipleOpcode(), llvm::cl::OptionValueBase< DataType, std::is_class< DataType >::value >::getValue(), llvm::SelectionDAGBuilder::getValueImpl(), llvm::SIInstrInfo::getVALUOp(), llvm::MipsABIInfo::GetVarArgRegs(), getVariant(), getVariantKind(), llvm::RISCVMCExpr::getVariantKindName(), llvm::AArch64MCExpr::getVariantKindName(), getVCmpInst(), getVectorCompareInfo(), llvm::MVT::getVectorElementType(), llvm::HexagonSubtarget::getVectorLength(), llvm::MVT::getVectorNumElements(), getVectorRegSize(), llvm::Triple::getVendorTypeName(), getVersionMinDirective(), getVGPRSpillRestoreOpcode(), getVGPRSpillSaveOpcode(), llvm::X86::getVPCMPImmForCond(), getVPTESTMOpc(), llvm::MVT::getVT(), llvm::object::WasmObjectFile::getWasmSymbolValue(), llvm::Triple::getWatchOSVersion(), getWholeProgDevirtResByArgKindName(), getWholeProgDevirtResKindName(), llvm::SIMachineFunctionInfo::getWorkGroupIDSGPR(), llvm::SIMachineFunctionInfo::getWorkItemIDVGPR(), getX86SSEConditionCode(), getX86XALUOOp(), getYMMtoXMMLoadOpcode(), getYMMtoXMMStoreOpcode(), giveUpWithRemarks(), llvm::MipsCallLowering::MipsHandler::handle(), handleADRP(), llvm::Metadata::handleChangedOperand(), llvm::DWARFVerifier::handleDebugAbbrev(), HandleInlinedEHPad(), llvm::MCCodePadder::handleInstructionEnd(), handleMemIntrinsicPtrUse(), llvm::Constant::handleOperandChange(), handlePhiDef(), llvm::objcarc::BottomUpPtrState::HandlePotentialAlterRefCount(), llvm::objcarc::TopDownPtrState::HandlePotentialAlterRefCount(), llvm::objcarc::BottomUpPtrState::HandlePotentialUse(), llvm::objcarc::TopDownPtrState::HandlePotentialUse(), llvm::PBQP::RegAlloc::RegAllocSolverImpl::handleUpdateCosts(), hasAnyNonFlatUseOfReg(), HasConditionalBranch(), llvm::DwarfCompileUnit::hasDwarfPubSections(), llvm::hash_value(), hasObjCCategoryInModule(), hasOnlySelectUsers(), llvm::X86RegisterInfo::hasReservedSpillSlot(), HasSecRelSymbolRef(), llvm::SIRegisterInfo::hasVGPRs(), llvm::HexagonLowerToMC(), llvm::rdf::NodeAllocator::id(), llvm::ARM_PROC::IFlagsToString(), llvm::ARM_PROC::IModToString(), llvm::GCNRegPressure::inc(), llvm::vfs::VFSFromYamlDirIterImpl::increment(), llvm::InterferenceCache::init(), llvm::XCoreMCInstLower::Initialize(), llvm::MipsMCInstLower::Initialize(), INITIALIZE_PASS(), llvm::ExecutionEngine::InitializeMemory(), llvm::TargetLowering::initializeSplitCSR(), llvm::HexagonSubtarget::initializeSubtargetDependencies(), llvm::MCObjectFileInfo::InitMCObjectFileInfo(), llvm::yaml::BlockScalarTraits< Module >::input(), llvm::BPFInstrInfo::insertBranch(), llvm::HexagonInstrInfo::insertBranch(), llvm::TargetInstrInfo::insertBranch(), llvm::SITargetLowering::insertCopiesSplitCSR(), llvm::AArch64TargetLowering::insertCopiesSplitCSR(), llvm::PPCTargetLowering::insertCopiesSplitCSR(), llvm::TargetLowering::insertCopiesSplitCSR(), InsertFPConstInst(), InsertFPImmInst(), llvm::SIInstrInfo::insertIndirectBranch(), llvm::TargetInstrInfo::insertIndirectBranch(), InsertLDR_STR(), llvm::TargetInstrInfo::insertNoop(), llvm::TargetInstrInfo::insertOutlinedCall(), InsertSEH(), llvm::AArch64InstrInfo::insertSelect(), llvm::SystemZInstrInfo::insertSelect(), llvm::TargetInstrInfo::insertSelect(), InsertSPConstInst(), InsertSPImmInst(), llvm::SIInstrInfo::insertVectorSelect(), instrDefsUsesSCC(), llvm::PPCInstrInfo::instrHasImmForm(), llvm::RegBankSelect::InstrInsertPoint::InstrInsertPoint(), llvm::TargetLoweringBase::InstructionOpcodeToISD(), instrumentMaskedLoadOrStore(), llvm::ARM_ISB::InstSyncBOptToString(), IntCCToARMCC(), llvm::intCCToAVRCC(), IntCondCCodeToICC(), llvm::rdf::CopyPropagation::interpretAsCopy(), llvm::IntervalIterator< NodeTy, OrigContainer_t, GT, IGT >::IntervalIterator(), inverseMinMax(), inversePermutation(), llvm::object::is32bit(), is32Bit(), is64BitKind(), llvm::isAArch64FrameOffsetLegal(), llvm::PseudoSourceValue::isAliased(), isAllocSiteRemovable(), llvm::objcarc::IsAlwaysTail(), isAMCompletelyFolded(), IsAnAddressOperand(), llvm::AArch64InstrInfo::isAsCheapAsAMove(), llvm::isAsynchronousEHPersonality(), llvm::objcarc::IsAutorelease(), llvm::mca::Scheduler::isAvailable(), IsAvailableOnEntry(), llvm::MemoryDepChecker::Dependence::isBackward(), llvm::object::COFFSymbolRef::isBigObj(), llvm::RISCVInstrInfo::isBranchOffsetInRange(), llvm::MipsInstrInfo::isBranchOffsetInRange(), llvm::AVRInstrInfo::isBranchOffsetInRange(), llvm::TargetInstrInfo::isBranchOffsetInRange(), isBSDLike(), isCalleeLoad(), isCallPromotable(), llvm::SITargetLowering::isCanonicalized(), isCatchAll(), llvm::X86InstrInfo::isCoalescableExtInstr(), llvm::PseudoSourceValue::isConstant(), isConstant(), llvm::TargetLowering::isConstTrueVal(), isCopyToExec(), llvm::IsCPSRDead< MCInst >(), isCrossCopy(), ISDCCtoARCCC(), isDefInSubRange(), isDispSafeForFrameIndex(), llvm::CastInst::isEliminableCastPair(), isEvenReg(), llvm::ConstantFP::isExactlyValue(), llvm::TargetLowering::isExtendedTrueVal(), llvm::TargetLoweringBase::isExtFree(), isFloatingPointZero(), llvm::CallBase::isFnAttrDisallowedByOpBundle(), llvm::MemoryDepChecker::Dependence::isForward(), llvm::objcarc::IsForwarding(), llvm::ARMBaseRegisterInfo::isFrameOffsetLegal(), llvm::TargetRegisterInfo::isFrameOffsetLegal(), llvm::isFuncletEHPersonality(), isFuncletReturnInstr(), llvm::TargetInstrInfo::isFunctionSafeToOutlineFrom(), isGEPFoldable(), llvm::isGuaranteedToExecuteForEveryIteration(), isHardwareLoop(), llvm::MachineOperand::isIdenticalTo(), llvm::X86II::isImmPCRel(), llvm::X86II::isImmSigned(), isImplicitlyDef(), isImplicitOperandIn(), isIndirectBrTarget(), llvm::SIInstrInfo::isInlineConstant(), llvm::X86TargetLowering::isIntDivCheap(), llvm::GlobalValue::isInterposableLinkage(), IsKnownPredicateViaMinOrMax(), llvm::SITargetLowering::isLegalAddressingMode(), llvm::X86Subtarget::isLegalToCallImmediateAddr(), llvm::SIInstrInfo::isLiteralConstantLike(), isLiveOut(), isLoadStoreThatCanHandleDisplacement(), isLoopInvariant(), isMatchingOrAlias(), isMatchingStore(), llvm::ScalarEvolution::isMonotonicPredicate(), IsMovepDestinationRegPair(), isMulPowOf2(), isNEONModifiedImm(), llvm::objcarc::IsNeverTail(), isNonILP32reloc(), llvm::CastInst::isNoopCast(), llvm::objcarc::IsNoopOnNull(), llvm::isNoOpWithoutInvoke(), llvm::objcarc::IsNoThrow(), isObjectDereferencedInBlock(), isOpcWithIntImmediate(), isOptimizingForSize(), isPerfectIncrement(), isProfitableForVectorization(), llvm::ARMTargetLowering::isReadOnly(), llvm::PPCInstrInfo::isReallyTriviallyReMaterializable(), isRegOrImmWithInputMods(), llvm::object::XCOFFObjectFile::isRelocatableObject(), isRemainderZero(), isRemovable(), llvm::objcarc::IsRetain(), isReturnNonNull(), IsRevOpcode(), llvm::MemoryDepChecker::Dependence::isSafeForVectorization(), llvm::isScopedEHPersonality(), llvm::object::XCOFFObjectFile::isSectionBSS(), llvm::object::XCOFFObjectFile::isSectionCompressed(), llvm::object::XCOFFObjectFile::isSectionData(), llvm::object::XCOFFObjectFile::isSectionText(), llvm::object::XCOFFObjectFile::isSectionVirtual(), isSETCCorConvertedSETCC(), isSExtLoad(), isSignedOp(), isSinCosLibcallAvailable(), isSortedByValueNo(), llvm::FullDependence::isSplitable(), isSupportedGuardInstruction(), llvm::MCParserUtils::isSymbolUsedInExpression(), isTopLevelPadForMSVC(), IsUnconditionalJump(), llvm::objcarc::IsUser(), llvm::HexagonInstrInfo::isValidAutoIncImm(), isValidDisp(), llvm::HexagonInstrInfo::isValidOffset(), isVShiftRImm(), isWeak(), isX86CCUnsigned(), llvm::json::Value::kind(), llvm::LPAC::lanaiAluCodeToString(), llvm::LPCC::lanaiCondCodeToString(), llvm::MCAssembler::layout(), llvm::AArch64LegalizerInfo::legalizeCustom(), llvm::AMDGPULegalizerInfo::legalizeCustom(), llvm::SIInstrInfo::legalizeOperandsVOP2(), LLVMBinaryGetType(), LLVMCreateGenericValueOfFloat(), LLVMDisasmInstruction(), LLVMGenericValueToFloat(), LLVMGetAlignment(), LLVMGetComdatSelectionKind(), LLVMGetIndices(), LLVMGetLinkage(), LLVMGetNumIndices(), LLVMGetThreadLocalMode(), LLVMGetTypeKind(), LLVMGetUnnamedAddress(), LLVMRemarkParserGetErrorMessage(), LLVMRemarkParserGetNext(), LLVMRemarkParserHasError(), LLVMSetAlignment(), llvm::MipsSEInstrInfo::loadImmediate(), llvm::ARCInstrInfo::loadImmediate(), llvm::RuntimeDyldELF::loadObject(), llvm::BPFInstrInfo::loadRegFromStackSlot(), llvm::RISCVInstrInfo::loadRegFromStackSlot(), llvm::MSP430InstrInfo::loadRegFromStackSlot(), llvm::LanaiInstrInfo::loadRegFromStackSlot(), llvm::AVRInstrInfo::loadRegFromStackSlot(), llvm::SparcInstrInfo::loadRegFromStackSlot(), llvm::HexagonInstrInfo::loadRegFromStackSlot(), llvm::ARMBaseInstrInfo::loadRegFromStackSlot(), llvm::TargetInstrInfo::loadRegFromStackSlot(), longformBranchOpcode(), loopDispositionToStr(), llvm::MSP430MCInstLower::Lower(), llvm::BPFMCInstLower::Lower(), llvm::LanaiMCInstLower::Lower(), llvm::WebAssemblyMCInstLower::lower(), llvm::LegalizerHelper::lower(), lower128BitShuffle(), lower1BitShuffle(), lower256BitShuffle(), lower512BitShuffle(), LowerADDC_ADDE_SUBC_SUBE(), LowerADDSAT_SUBSAT(), lowerAddSubToHorizontalOp(), LowerADJUST_TRAMPOLINE(), llvm::PPCTargetLowering::LowerAsmOperandForConstraint(), lowerAtomicArithWithLOCK(), LowerAtomicRMWInst(), llvm::HexagonTargetLowering::LowerBITCAST(), LowerBSWAP(), LowerBUILD_VECTORAsVariablePermute(), llvm::HexagonTargetLowering::LowerCall(), llvm::SITargetLowering::LowerCall(), llvm::NVPTXTargetLowering::LowerCall(), llvm::TargetLowering::LowerCall(), llvm::SparcTargetLowering::LowerCall_32(), llvm::SparcTargetLowering::LowerCall_64(), lowerCallResult(), llvm::SITargetLowering::LowerCallResult(), LowerCallResult(), LowerCMP_SWAP(), llvm::AsmPrinter::lowerConstant(), llvm::AMDGPUTargetLowering::LowerCTLZ_CTTZ(), llvm::TargetLowering::LowerCustomJumpTableEntry(), LowerF128_FPEXTEND(), LowerF128_FPROUND(), llvm::SparcTargetLowering::LowerF128Compare(), llvm::HexagonTargetLowering::LowerFormalArguments(), llvm::SITargetLowering::LowerFormalArguments(), llvm::SystemZTargetLowering::LowerFormalArguments(), llvm::TargetLowering::LowerFormalArguments(), llvm::SparcTargetLowering::LowerFormalArguments_32(), LowerFPToInt(), llvm::AMDGPUTargetLowering::LowerFROUND(), llvm::HexagonTargetLowering::LowerGlobalTLSAddress(), llvm::HexagonTargetLowering::LowerINLINEASM(), llvm::AVRMCInstLower::lowerInstruction(), LowerInterruptReturn(), LowerINTRINSIC_W_CHAIN(), LowerLargeShift(), LowerMINMAX(), lowerMSABitClearImm(), LowerMULH(), llvm::XCoreMCInstLower::LowerOperand(), llvm::ARCMCInstLower::LowerOperand(), llvm::AArch64MCInstLower::lowerOperand(), llvm::MipsMCInstLower::LowerOperand(), LowerOperand(), llvm::ARMAsmPrinter::lowerOperand(), llvm::R600TargetLowering::LowerOperation(), llvm::BPFTargetLowering::LowerOperation(), llvm::SparcTargetLowering::LowerOperation(), llvm::ARCTargetLowering::LowerOperation(), llvm::LanaiTargetLowering::LowerOperation(), llvm::MSP430TargetLowering::LowerOperation(), llvm::AVRTargetLowering::LowerOperation(), llvm::XCoreTargetLowering::LowerOperation(), llvm::HexagonTargetLowering::LowerOperation(), llvm::AMDGPUTargetLowering::LowerOperation(), llvm::AArch64TargetLowering::LowerOperation(), llvm::ARMTargetLowering::LowerOperation(), llvm::NVPTXTargetLowering::LowerOperation(), llvm::SystemZTargetLowering::LowerOperation(), llvm::PPCTargetLowering::LowerOperation(), llvm::X86TargetLowering::LowerOperation(), llvm::TargetLowering::LowerOperation(), llvm::SystemZTargetLowering::LowerOperationWrapper(), llvm::LowerPPCMachineOperandToMCOperand(), lowerRegToMasks(), llvm::SITargetLowering::LowerReturn(), llvm::NVPTXTargetLowering::LowerReturn(), llvm::TargetLowering::LowerReturn(), llvm::SparcTargetLowering::LowerReturn_32(), llvm::SparcTargetLowering::LowerReturn_64(), LowerRotate(), LowerScalarImmediateShift(), llvm::MSP430TargetLowering::LowerShifts(), lowerShuffleAsBlend(), lowerSymbolOperand(), LowerSymbolOperand(), llvm::AVRMCInstLower::lowerSymbolOperand(), llvm::MSP430MCInstLower::LowerSymbolOperand(), llvm::BPFMCInstLower::LowerSymbolOperand(), llvm::LanaiMCInstLower::LowerSymbolOperand(), llvm::AArch64MCInstLower::lowerSymbolOperandDarwin(), LowerToTLSExecModel(), LowerTruncateVecI1(), lowerUINT_TO_FP_vec(), lowerV8I16GeneralSingleInputShuffle(), LowerVASTART(), llvm::HexagonTargetLowering::LowerVECTOR_SHUFFLE(), lowerVECTOR_SHUFFLE_VSHF(), LowerVectorFP_TO_INT(), LowerVectorINT_TO_FP(), lowerVectorShuffle(), LowerVSETCC(), lowerX86FPLogicOp(), llvm::jitlink::MachOJITLinker_x86_64::MachOJITLinker_x86_64(), llvm::sys::fs::make_absolute(), llvm::SparcTargetLowering::makeAddress(), llvm::ConstantRange::makeAllowedICmpRegion(), makeCombineInst(), llvm::ARMTargetLowering::makeDMB(), llvm::object::ObjectFile::makeTriple(), makeVisible(), map_from_llvmDWARFsourcelanguage(), map_from_llvmModFlagBehavior(), map_from_llvmopcode(), map_to_llvmModFlagBehavior(), map_to_llvmopcode(), mapBinOpcode(), mapFromLLVMOrdering(), mapLeafRecordImpl(), mapMemberRecordImpl(), mapOverflowResult(), llvm::yaml::MappingTraits< std::unique_ptr< WasmYAML::Section > >::mapping(), llvm::yaml::MappingTraits< WasmYAML::Import >::mapping(), llvm::yaml::MappingTraits< WasmYAML::SymbolInfo >::mapping(), llvm::yaml::MappingTraits< const InterfaceFile * >::mapping(), llvm::ExecutionEngine::mapSectionAddress(), llvm::RuntimeDyldImpl::mapSectionAddress(), llvm::rdf::PhysicalRegisterInfo::mapTo(), mapToLLVMOrdering(), llvm::HexagonEvaluator::mask(), llvm::Intrinsic::matchIntrinsicType(), llvm::objcarc::TopDownPtrState::MatchWithRelease(), llvm::objcarc::BottomUpPtrState::MatchWithRetain(), llvm::GlobalValue::materialize(), llvm::TargetRegisterInfo::materializeFrameBaseRegister(), maybePrintComdat(), maybeSetDSOLocal(), MaySpeculate(), mayTailCallThisCC(), mayUseP9Setb(), llvm::MCSymbol::MCSymbol(), meetBDVStateImpl(), llvm::ARM_MB::MemBOptToString(), memVTFromAggregate(), DIAErrorCategory::message(), minMaxOpcToMin3Max3Opc(), Mips16WhichOp8uOr16simm(), llvm::Mips::MipsFCCToString(), llvm::APFloat::mod(), llvm::LegalizerHelper::moreElementsVector(), llvm::object::XCOFFObjectFile::moveRelocationNext(), llvm::object::XCOFFObjectFile::moveSectionNext(), llvm::object::XCOFFObjectFile::moveSymbolNext(), llvm::SIInstrInfo::moveToVALU(), llvm::APFloat::multiply(), llvm::yaml::ScalarTraits< FlowStringRef >::mustQuote(), llvm::yaml::TaggedScalarTraits< ScalarDocNode >::mustQuote(), llvm::IRMutationStrategy::mutate(), needsPCRel(), negateFMAOpcode(), negateICmpIfUsedByBranchOrSelectOnly(), nextReg(), llvm::Triple::normalize(), llvm::NVPTXTargetMachine64::NVPTXTargetMachine64(), llvm::User::operator delete(), llvm::MDNode::operator delete(), llvm::orc::SimpleCompiler::operator()(), FusionCandidateCompare::operator()(), llvm::ImutAVLTreeGenericIterator< ImutInfo >::operator++(), llvm::ImutAVLTreeGenericIterator< ImutInfo >::operator--(), NewGVN::ValueDFS::operator<(), llvm::objcarc::operator<<(), llvm::raw_ostream::operator<<(), llvm::operator==(), llvm::json::operator==(), llvm::ScheduleDAGInstrs::Value2SUsMap::operator(), llvm::FastISel::optimizeCmpPredicate(), llvm::X86InstrInfo::optimizeCompareInstr(), llvm::AArch64InstrInfo::optimizeCondBranch(), OptimizeGlobalAddressOfMalloc(), llvm::TargetInstrInfo::optimizeSelect(), llvm::opt::OptTable::OptTable(), OtherSucc(), llvm::SDep::overlaps(), llvm::DWARFUnitIndex::parse(), llvm::vfs::RedirectingFileSystemParser::parse(), llvm::ARM::parseArchProfile(), llvm::ARM::parseArchVersion(), llvm::yaml::Document::parseBlockNode(), parseCond(), parseCondBranch(), parseImmediate(), llvm::orc::PartitioningIRMaterializationUnit::PartitioningIRMaterializationUnit(), llvm::PassNameParser::passRegistered(), Passv64i1ArgInRegs(), PeepholePPC64ZExtGather(), false::LibCallsShrinkWrap::perform(), performAtomicOp(), PerformExtendCombine(), PerformIntrinsicCombine(), performMaskedAtomicOp(), performNEONPostLDSTCombine(), PerformShiftCombine(), PickMostRelevantLoop(), llvm::PPCInstrInfo::PredicateInstruction(), PrepareCall(), llvm::LegacyDivergenceAnalysis::print(), llvm::MemoryAccess::print(), llvm::SCEV::print(), llvm::Value::print(), llvm::AliasSet::print(), llvm::DIEValue::print(), llvm::AVRAsmPrinter::PrintAsmMemoryOperand(), llvm::HexagonAsmPrinter::PrintAsmMemoryOperand(), llvm::X86AsmPrinter::PrintAsmOperand(), llvm::X86InstPrinterCommon::printCMPMnemonic(), llvm::NVPTXInstPrinter::printCmpMode(), llvm::X86InstPrinterCommon::printCondCode(), printConstant(), llvm::PPCInstPrinter::printcrbitm(), llvm::NVPTXInstPrinter::printCvtMode(), llvm::SparcInstPrinter::printGetPCX(), llvm::LanaiMCExpr::printImpl(), llvm::ARMMCExpr::printImpl(), llvm::MipsMCExpr::printImpl(), llvm::NVPTXFloatMCExpr::printImpl(), llvm::PPCMCExpr::printImpl(), llvm::MSP430InstPrinter::printInst(), llvm::MipsInstPrinter::printInst(), llvm::NVPTXInstPrinter::printLdStCode(), printMCExpr(), llvm::ARMInstPrinter::printMSRMaskOperand(), llvm::HexagonInstPrinter::printOperand(), llvm::SystemZInstPrinter::printOperand(), llvm::AVRAsmPrinter::printOperand(), llvm::HexagonAsmPrinter::printOperand(), llvm::ARMAsmPrinter::printOperand(), llvm::MipsAsmPrinter::printOperand(), llvm::ARMInstPrinter::printPCLabel(), llvm::AArch64InstPrinter::printPostIncOperand(), llvm::PPCInstPrinter::printPredicateOperand(), PrintQuotedString(), llvm::printReg(), llvm::MCInstPrinter::printRegName(), llvm::AMDGPUInstPrinter::printRegOperand(), llvm::X86InstPrinterCommon::printRoundingControl(), printSImmOperand(), llvm::X86InstPrinterCommon::printSSEAVXCC(), llvm::AArch64InstPrinter::printSVERegOp(), llvm::X86InstPrinterCommon::printVPCMPMnemonic(), llvm::X86InstPrinterCommon::printVPCOMMnemonic(), llvm::AArch64InstPrinter::printZPRasFPR(), llvm::PPCFrameLowering::processFunctionBeforeFrameFinalized(), llvm::RuntimeDyldCOFFI386::processRelocationRef(), llvm::RuntimeDyldCOFFThumb::processRelocationRef(), llvm::RuntimeDyldELF::processRelocationRef(), processUMulZExtIdiom(), PromoteMaskArithmetic(), llvm::propagateMetadata(), llvm::LiveIntervals::pruneValue(), llvm::rdf::DataFlowGraph::pushAllDefs(), PushArgMD(), readAbbreviatedField(), readModuleTriple(), llvm::ARMAsmBackend::reasonForFixupRelaxation(), llvm::TargetInstrInfo::reassociateOps(), llvm::ARMHazardRecognizer::RecedeCycle(), llvm::PPCDispatchGroupSBHazardRecognizer::RecedeCycle(), llvm::GCNHazardRecognizer::RecedeCycle(), llvm::ARMFunctionInfo::recordCPEClone(), recoverFramePointer(), llvm::TargetInstrInfo::reduceLoopCount(), RefineErrorLoc(), llvm::RegisterBankInfo::RegisterBankInfo(), llvm::RISCVAsmBackend::relaxInstruction(), llvm::ScheduleDAGMI::releasePred(), llvm::ScheduleDAGMI::releaseSucc(), llvm::wasm::relocTypetoString(), llvm::APFloat::remainder(), llvm::X86InstrInfo::reMaterialize(), llvm::HexagonInstrInfo::removeBranch(), llvm::TargetInstrInfo::removeBranch(), removeExternalCFGEdges(), llvm::GlobalValue::removeFromParent(), llvm::rdf::CodeNode::removeMember(), llvm::removeUnwindEdge(), llvm::Record::removeValue(), replaceAllUsesOfWithIn(), llvm::VPValue::replaceAllUsesWith(), llvm::ReplaceableMetadataImpl::replaceAllUsesWith(), llvm::TargetInstrInfo::replaceBranchWithTailCall(), ReplaceCMP_SWAP_128Results(), llvm::InstCombiner::replacedSelectWithOperand(), ReplaceFPIntrinsicWithCall(), ReplaceFrameIndex(), llvm::R600TargetLowering::ReplaceNodeResults(), llvm::RISCVTargetLowering::ReplaceNodeResults(), llvm::XCoreTargetLowering::ReplaceNodeResults(), llvm::SparcTargetLowering::ReplaceNodeResults(), llvm::ARMTargetLowering::ReplaceNodeResults(), llvm::PPCTargetLowering::ReplaceNodeResults(), llvm::X86TargetLowering::ReplaceNodeResults(), llvm::TargetLowering::ReplaceNodeResults(), llvm::report_bad_alloc_error(), llvm::MIRParserImpl::reportDiagnostic(), llvm::HexagonPacketizerList::reserveResourcesForConstExt(), llvm::cl::ResetAllOptionOccurrences(), llvm::rdf::Liveness::resetKills(), llvm::object::resolveAArch64(), llvm::object::resolveAmdgpu(), llvm::object::resolveARM(), llvm::object::resolveAVR(), llvm::object::resolveBPF(), llvm::object::resolveCOFFX86(), llvm::object::resolveCOFFX86_64(), llvm::SIRegisterInfo::resolveFrameIndex(), llvm::TargetRegisterInfo::resolveFrameIndex(), llvm::object::resolveHexagon(), llvm::object::resolveLanai(), llvm::object::resolveMachOX86_64(), llvm::object::resolveMips32(), llvm::object::resolveMips64(), llvm::object::resolvePPC32(), llvm::object::resolvePPC64(), llvm::RuntimeDyldELFMips::resolveRelocation(), llvm::RuntimeDyldCOFFX86_64::resolveRelocation(), llvm::RuntimeDyldMachOX86_64::resolveRelocation(), llvm::RuntimeDyldMachOI386::resolveRelocation(), llvm::RuntimeDyldCOFFI386::resolveRelocation(), llvm::RuntimeDyldCOFFThumb::resolveRelocation(), llvm::RuntimeDyldELF::resolveRelocation(), llvm::RuntimeDyldMachOARM::resolveRelocation(), llvm::RuntimeDyldMachOAArch64::resolveRelocation(), llvm::object::resolveSparc64(), resolveSymbol(), llvm::object::resolveSystemZ(), llvm::object::resolveWasm32(), llvm::object::resolveX86(), llvm::object::resolveX86_64(), llvm::Thumb1FrameLowering::restoreCalleeSavedRegisters(), llvm::Mips16InstrInfo::restoreFrame(), llvm::X86FrameLowering::restoreWin32EHStackPointers(), llvm::MSP430InstrInfo::reverseBranchCondition(), llvm::AArch64InstrInfo::reverseBranchCondition(), llvm::TargetRegisterInfo::reverseComposeSubRegIndexLaneMaskImpl(), llvm::rewriteARMFrameIndex(), llvm::ThumbRegisterInfo::rewriteFrameIndex(), rewritesSort(), llvm::rewriteT2FrameIndex(), llvm::RISCVTargetELFStreamer::RISCVTargetELFStreamer(), llvm::RISCVFPRndMode::roundingModeToString(), llvm::APIntOps::RoundingSDiv(), llvm::APIntOps::RoundingUDiv(), llvm::rdf::CopyPropagation::run(), llvm::MCJIT::runFunction(), llvm::orc::OrcMCJITReplacement::runFunction(), llvm::SelectionDAGISel::RunSDNodeXForm(), scalarizeExtEltFP(), llvm::scalbn(), llvm::SIScheduleBlock::schedule(), llvm::ScheduleDAGMILive::scheduleMI(), llvm::PostGenericScheduler::scheduleTree(), llvm::SDep::SDep(), llvm::object::XCOFFObjectFile::section_begin(), llvm::object::XCOFFObjectFile::section_end(), llvm::object::XCOFFObjectFile::section_rel_begin(), llvm::object::XCOFFObjectFile::section_rel_end(), llvm::object::BindRebaseSegInfo::segmentName(), selectDisp(), llvm::HexagonDAGToDAGISel::SelectHVXDualOutput(), selectI64Imm(), llvm::HexagonDAGToDAGISel::SelectIndexedLoad(), llvm::HexagonDAGToDAGISel::SelectIndexedStore(), llvm::NVPTXDAGToDAGISel::SelectInlineAsmMemoryOperand(), llvm::FastISel::selectOperator(), llvm::FastISel::selectPatchpoint(), selectReg(), selectSGPRVectorRegClassID(), llvm::HvxSelector::selectShuffle(), llvm::HexagonDAGToDAGISel::SelectV65Gather(), llvm::HexagonDAGToDAGISel::SelectV65GatherPred(), llvm::MCSymbolELF::setBinding(), llvm::LTOCodeGenerator::setDebugInfo(), llvm::ARMBaseInstrInfo::setExecutionDomain(), setImmutableRefs(), llvm::MipsABIFlagsSection::setISALevelAndRevisionFromPredicates(), llvm::ExecutionEngine::setObjectCache(), llvm::LTOCodeGenerator::setOptLevel(), llvm::ExecutionEngine::setProcessAllSections(), llvm::Instruction::setSuccessor(), llvm::MCSymbolELF::setType(), setUnwindEdgeTo(), shouldAlwaysEmitCompleteClassType(), llvm::TargetInstrInfo::shouldClusterMemOps(), shouldEmitUdt(), llvm::RISCVAsmBackend::shouldForceRelocation(), shouldScheduleAdjacent(), ShrinkDemandedConstant(), ShrinkLoadReplaceStoreWithStore(), shrinkScalarLogicOp(), adjust::signed_width(), simplifyAllocaArraySize(), SimplifyBinOp(), simplifyDivRem(), SimplifyICmpInst(), simplifyICmpWithZero(), simplifyInvariantGroupIntrinsic(), SimplifyMOVSX(), SimplifyNVVMIntrinsic(), llvm::TargetLowering::SimplifySetCC(), simplifyX86immShift(), simplifyX86varShift(), llvm::DIEInteger::SizeOf(), llvm::DIEString::SizeOf(), llvm::DIEEntry::SizeOf(), llvm::DIEValue::SizeOf(), llvm::DIELoc::SizeOf(), llvm::DIEBlock::SizeOf(), sizeOfSPAdjustment(), skipAbbreviatedField(), llvm::ImutAVLTreeGenericIterator< ImutInfo >::skipToParent(), smallData(), llvm::TargetLowering::softenSetCCOperands(), llvm::SPARCCondCodeToString(), llvm::Thumb1FrameLowering::spillCalleeSavedRegisters(), StackMallocSizeClass(), llvm::StackMaps::StackMaps(), llvm::MDNode::storeDistinctInContext(), llvm::MDNode::storeImpl(), llvm::BPFInstrInfo::storeRegToStackSlot(), llvm::RISCVInstrInfo::storeRegToStackSlot(), llvm::MSP430InstrInfo::storeRegToStackSlot(), llvm::LanaiInstrInfo::storeRegToStackSlot(), llvm::AVRInstrInfo::storeRegToStackSlot(), llvm::SparcInstrInfo::storeRegToStackSlot(), llvm::HexagonInstrInfo::storeRegToStackSlot(), llvm::ARMBaseInstrInfo::storeRegToStackSlot(), llvm::TargetInstrInfo::storeRegToStackSlot(), streamMapping(), StrengthenNoWrapFlags(), stripModuloOnShift(), subtargetEncodingFamily(), llvm::APFloat::subtract(), sumEdgeCount(), swapMIOperands(), switchToSelect(), llvm::object::XCOFFObjectFile::symbol_begin(), llvm::object::XCOFFObjectFile::symbol_end(), llvm::object::SymbolicFile::SymbolicFile(), llvm::InstructionSelector::testImmPredicate_APFloat(), llvm::InstructionSelector::testImmPredicate_APInt(), llvm::InstructionSelector::testImmPredicate_I64(), llvm::InstructionSelector::testMIPredicate_MI(), llvm::thinLTOResolvePrevailingInModule(), llvm::mca::toHWStallEventType(), llvm::msgpack::DocNode::toString(), llvm::wasm::toString(), llvm::APInt::toString(), llvm::WebAssembly::toValType(), llvm::ARM_TSB::TraceSyncBOptToString(), translateAccessFlags(), TranslateIntegerX86CC(), translateMethodKindFlags(), translatePtrToMemberRep(), TranslateX86CC(), translateX86FSETCC(), llvm::InnerLoopVectorizer::truncateToMinimalBitwidths(), llvm::AMDGPUSymbolizer::tryAddingPcLoadReferenceComment(), tryCombineFixedPointConvert(), llvm::LegalizationArtifactCombiner::tryCombineInstruction(), tryCombineShiftImm(), tryPromoteAllocaToVector(), typeForRegClass(), TypeSizeToSizeIndex(), llvm::HexagonPacketizerList::undoChangedOffset(), llvm::X86InstrInfo::unfoldMemoryOperand(), unifyBitWidth(), UnpackFromArgumentSlot(), unpackFromMemLoc(), unpackFromRegLoc(), llvm::CrashRecoveryContext::unregisterCleanup(), llvm::UnrollAndJamLoop(), unrollVectorShift(), adjust::unsigned_width(), UpdatePredRedefs(), upgradeAVX512MaskToSelect(), upgradeMaskedCompare(), upgradeX86vpcom(), UpgradeX86VPERMT2Intrinsics(), llvm::HexagonPacketizerList::useCalleesSP(), llvm::HexagonPacketizerList::useCallersSP(), llvm::AArch64TTIImpl::useReductionIntrinsic(), useSinCos(), llvm::Mips16InstrInfo::validImmediate(), llvm::ValueHandleBase::ValueIsDeleted(), llvm::ValueHandleBase::ValueIsRAUWd(), VectorizePTXValueVTs(), llvm::PHITransAddr::Verify(), llvm::LoopInfoBase< BasicBlock, Loop >::verify(), verifyAddrSpace(), verifyCTRBranch(), VerifyLowRegs(), VerifyPHIs(), VerifySDNode(), VerifySubExpr(), llvm::InstVisitor< ObjectSizeOffsetVisitor, SizeOffsetType >::visit(), llvm::SCEVVisitor< SCEVLoopAddRecRewriter, const SCEV *>::visit(), llvm::SelectionDAGBuilder::visit(), llvm::sroa::AllocaSliceRewriter::visit(), llvm::SCEVTraversal< SV >::visitAll(), llvm::Interpreter::visitAShr(), llvm::Interpreter::visitBinaryOperator(), llvm::SelectionDAGBuilder::visitBitTestCase(), llvm::InstCombiner::visitCallInst(), llvm::SCEVVisitor< SCEVLoopAddRecRewriter, const SCEV *>::visitCouldNotCompute(), llvm::Interpreter::visitExtractElementInst(), llvm::Interpreter::visitExtractValueInst(), llvm::Interpreter::visitFCmpInst(), VisitGlobalVariableForEmission(), llvm::Interpreter::visitICmpInst(), llvm::InstCombiner::visitICmpInst(), llvm::Interpreter::visitInsertElementInst(), llvm::Interpreter::visitInsertValueInst(), llvm::Interpreter::visitInstruction(), llvm::InstVisitor< ObjectSizeOffsetVisitor, SizeOffsetType >::visitInstruction(), llvm::InstCombiner::visitInstruction(), llvm::Interpreter::visitPHINode(), llvm::Interpreter::visitShuffleVectorInst(), llvm::Interpreter::visitVAArgInst(), whichFPParamVariantNeeded(), llvm::InnerLoopVectorizer::widenInstruction(), llvm::InnerLoopVectorizer::widenPHIInstruction(), llvm::SparcTargetLowering::withTargetFlags(), llvm::wrap(), WriteConstantInternal(), llvm::orc::OrcGenericABI::writeResolverCode(), llvm::MCAssembler::writeSectionData(), llvm::orc::OrcGenericABI::writeTrampolines(), X86ChooseCmpImmediateOpcode(), llvm::coverage::CoverageMappingIterator::~CoverageMappingIterator(), and llvm::SelectionDAG::~SelectionDAG().